Follow the guides below to make sure you get it right the first time. With a pickup this revo­lu­tionary, you’re sure to have questions. No worries, we’ve got answers right here. 1. It's backwards! The rails should be under the plain strings for bending, right? No, they are not backwards. The rails produce a tight percussive tone, the poles a fat thick tone. If you reversed it, the wound strings would sound mushy and the plain strings would sound extra thin. Bending and note drop-out are not an issue, as there’s no drop-out anywhere on the pickup, even on the pole side, due to the powerful/wide magnetic field. See question #12. 2. Do Railhammer humbuckers sound good clean too? Yes, they sound fantastic clean… very full, clear and with a nice chimey treble. It’s our belief that a great pickup should sound amazing clean or dirty. Each model has a different level of clean available: the lower the output the more clean headroom the pickup will have. 3. Will Railhammers fit my guitar? They will fit any guitar that has standard size humbuckers. 4. Do Railhammer humbuckers with the metal covers sound different than the older uncovered ones? We use German silver (aka nickel silver) covers, which have a minimal effect on the sound. The older uncovered models are slightly brighter and have slightly less mids than the covered models. 5. Do you offer separate metal covers? Sorry, but we do not offer separate covers. We prefer to have them factory installed to ensure that the installation and wax potting process are done correctly to our standards. 6. 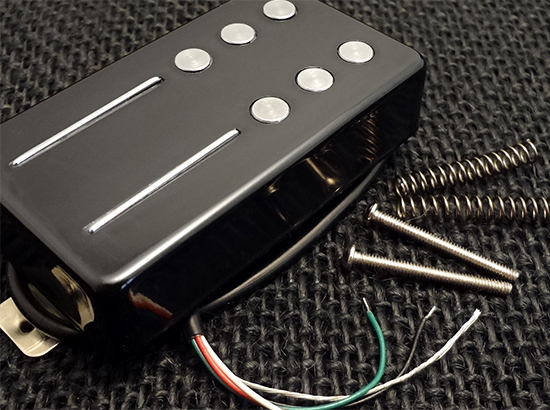 Can your pickups be coil split? Humbuckers: yes, these are 4 conductor wiring with independent ground. You can do all the wiring tricks like coil split, phase, and series/parallel. Humcutters: no, these can NOT be split, because then the pickup would only sense 3 strings. However, they can be wired for phase, and series/parallel. 7. 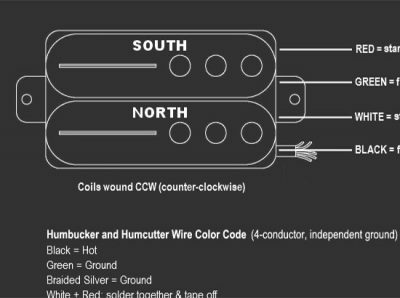 Do you offer guitar wiring diagrams? 8. Do Railhammers work in left-handed guitars? 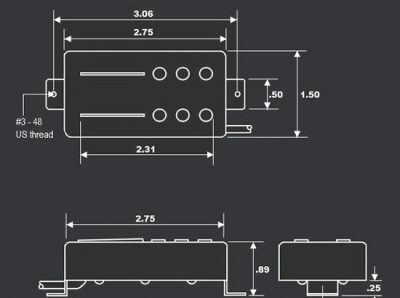 All our humbucker models will align properly in either right- or left-handed guitars. However, our current humcutter models only work in right-handed guitars. 9. Do pinch harmonics work well with Railhammers? Yes, they pop like fireworks! Because of the efficient magnetic structure, Railhammers are very responsive to anything you do with your right or left hand. 10. There are no adjustable pole pieces, should I be worried about uneven volume from string to string? No, we designed the rail with a taper, so it compensates for the typical lower volume of the D string. If you adjust the pickup according to the specs. in the Owner’s Manual, you shouldn’t have any issues. 11. Do the humbuckers sound like two different pickups? Do the rails sound like a single-coil? No, the sound is cohesive and musical. They still sound like humbuckers, but with more clarity on the lows, a more balanced EQ, and more responsive feel. 12. Is there volume drop out when you bend a string between the poles and rails? No, nothing noticeable. The magnetic structure is very efficient, due to the large diameter poles, and the rails having a large surface area coupled to the magnet. So the magnetic field is strong and wide, resulting in no significant volume drop out anywhere on the pickup. 13. How come you don't offer F-spacing, or different spacing for neck and bridge positions? You don’t need it. Railhammers have universal spacing that works with just about any guitar in any position, thanks to the oversize poles and long rails. 14. The poles do not line up perfectly with the strings, is this a problem? It’s not a problem, it will not affect the sound at all. The magnetic field is very strong and wide, so there is no dead area anywhere on the pickup. 15. What's better, alnico or ceramic magnets? Neither is better or worse, just different. We choose one or the other depending on what we’re trying to get out of a particular design. The type of magnet alone won’t tell you what a pickup sounds like. The product description will. 16. I'm confused by all these terms like K Ohms, Wire Gauge, Alnico, Ceramic... which model should I choose? These specs. are provided for informational purposes only. Despite what the music store guy or some internet forum geek claims, these specs. will NOT tell you what a pickup sounds like! 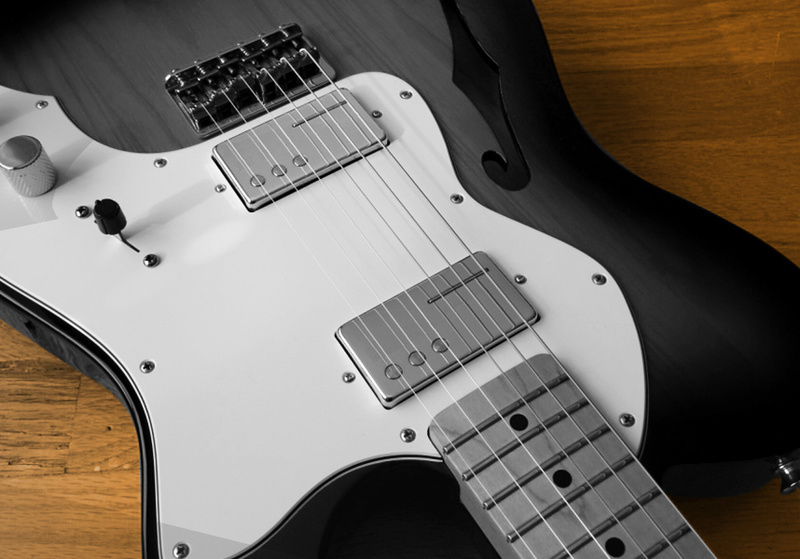 We suggest you IGNORE the technical specs, and pay close attention to the product descriptions and our Tone Chart. 17. Is Railhammer an American company, and where are they made? Railhammer is an American company based in Ohio, and the pickups are designed in the USA. Our pickups are made by a South Korean winder to proprietary specs, who we selected for their ability to build consistent, high-quality, custom-designed pickups. 18. Well if they're not made in the USA, why do they cost more than other imported pickups? One reason is that they cost way more to build. The bobbins, rails, poles, and baseplates are all custom spec. non-standard parts requiring expensive custom tooling. Another reason is that the design is patented, and patents aren’t cheap! And we put a hell of a lot of research & design into these pickups, and that’s why Railhammers offer performance as good or better than any pickups made anywhere, USA or otherwise… that alone makes them worth every penny. 19. Who designed the Railhammer pickups? Award-winning designer and guitar industry veteran Joe Naylor (Reverend Guitars, Naylor Amps, All-Tone Speakers, StringDog Products, Armor Gold Cables). 20. What is the exact composition and type of wire, steel, magnet, wax, etc. that you use? Sorry, we don’t give out any additional technical information other than what is already on our website, as much of it is confidential. 21. Do you sell pickup parts, covers, pots, capacitors, or any guitar parts? Sorry, we do not sell any separate components or any other guitar parts. 22. Can you make a custom or special order pickup for me? Sorry, we do not offer any custom, special order or modified products at all. We only offer what is shown on the website. 23. Do you sell direct? Sorry, we no longer sell direct. Railhammer pickups are available through dealers only. Find one near you here. 24. I am a guitar maker or retailer, can I buy wholesale? 25. Do you offer Artist Endorsements? Yes, we are interested in working with nationally known touring acts. If you fit this description, please contact us. Two-year warranty—Two years against defective materials and/or workmanship only. Warranty does not cover misuse, abuse, or wear/degradation from standard use. Warranty does not cover any damage to instrument for any reason. We will repair or replace product at our discretion. Ship product to address below. Include copy of receipt, return address, email, and description of problem. 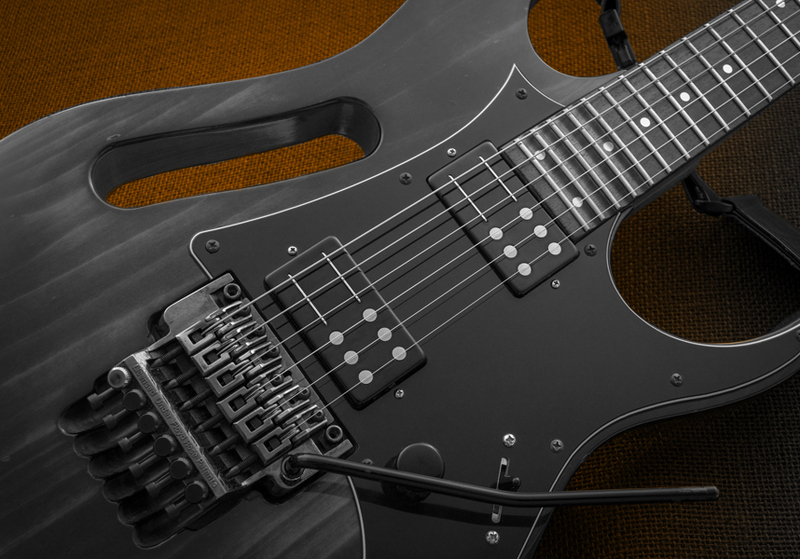 From vintage to high voltage, find the full line of Railhammer pickups here. Get a single, or a pair, at these fine locations. Copyright 2019 Haas Guitars LLC.